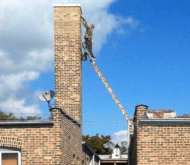 A safety trade body has announced the winner of its three month hunt to find the biggest idiot on a ladder. The Ladder Association invited members of the public to send in shots for its Idiots on Ladders campaign in September. We Still Don’t Know Who He Is! was apparent by the way he did the job with such a precarious drop below. Cameron Clow, Chairman of the Ladder Association, said: “This competition was all about raising awareness and as such it was run alongside the Ladder Exchange, which offers people and businesses the chance to trade in unsafe ladders for new, compliant ones. Ladders are arguably the most common type of equipment used for work at height – it is estimated that three million are in use in the UK alone. Ladders should only be used for light work and even then for a short time, Three points of contact with the ladder should be maintained at all times. A tray or shelf should be fitted for holding tools, etc. When using ladders to access a scaffold or platform, about five rungs must extend above, to provide a safe means of transferring to the platform. Tie a ladder at the top to secure it, not at the bottom. Reported ladder accidents have fallen by over 30% over the last 10 years, but more clearly needs to be done.